On Friday our own Maya Tams-Gray was elected to the Scottish Youth Parliament. Along with Hope Laing from Stromness Academy, Maya will represent the young people of Orkney. Our congratulations go to Maya and our commiserations to the other candidates, who are all KGS pupils: Rachel Evans, Elizabeth Gorn and Emma Grant. Our thanks go to all those who voted and to Cheryl Rafferty, Community Learning & Development Officer, for her part in administering the election. KGS pupil Jess Ewing was declared the winner of this year's Fereday Prize in Stromness yesterday. Her project 'How has the Italian Chapel been preserved for future generations?' was the overall winner of all the entrants from both schools. Magnus Craigie researched his family history and its connections to the Hall of Yenstay in Tankerness. He was placed second in KGS. Third was Murray Clark, whose investigation was on Orkney opticians in the past. Congratulations to all three, and to all those who were awarded certificates for their projects. KGS Library took delivery yesterday of almost £300 worth of new careers resources. The books came free of charge from publishers How2Become. They deal with how to enter popular careers, particularly with the tests and interviews required. They will be used by the school's Careers Advisers from Skills Development Scotland to help prepare pupils who are looking to enter these careers. A cheque for £292.67 was handed over to Susan Atkinson of Orkney Charitable Trust. The money was raised by pupils and staff on our Christmas Jumper Day in December. KGS has a new Police Community Liaison Officer – Sgt. Stewart Mackenzie. Sgt. Mackenzie will be a regular friendly police presence in school, popping in at least once a week at lunchtimes to meet pupils and staff. He will also be involved in some lessons and hold drop-in sessions. This is part of the positive support that the police can give KGS. Sgt. 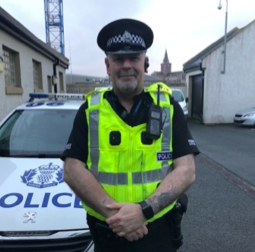 Mackenzie is based in Kirkwall and has 29 years policing experience. He recently transferred to Orkney from Edinburgh. Mr David Partner, former History teacher, local historian and author, yesterday presented KGS with copies of both volumes of his Kirkwall - in the footsteps of Hossack, which trace the development of the town over the last century. Mr Partner made this generous gift in memory of his uncle, David Alexander Eunson, who was Dux of the school in 1941, and of his own time as a pupil at Kirkwall Grammar School from 1945 to 1959. The books were accepted with much gratitude by Head Teacher Don Hawkins and will be held in the school library for present and future generations of pupils to learn about the history of Kirkwall. Also present were Librarian Harry Curran and the Acting Principal Teacher of Social Subjects, Mrs Samara Hoggan-Nisbet. On the 9th of November, five of our senior students (Niamh Ditchfield, Sophie Sullivan, Hamish Wright Baker, John Stevenson and Emma Grant) were selected by the Social Subjects team to go to an event hosted by Historic Environment Scotland. At this whole day activity, the pupils were joined by other young people from the Connect Project and from Papdale Primary and spent the day discussing sites of special significance within our town which require preservation. With support from local partners and HES, the students worked in teams to complete a pictorial map of Kirkwall that they used to argue their case for preservation. On the 6th of December our students were invited back, and while Sophie and Hamish could not attend due to other commitments, Emma, John and Niamh represented the views of students and young people across Kirkwall to finalise the list of five sites which will be brought to senior managers at Historic Environment Scotland for future preservation. With support from Dan Lee, archaeologist at Orkney College, Fran Hollinrake (custodian at St Magnus Cathedral and local historian), and Councillor John Ross Scott, our students came to the final decision that the sites requiring future preservation were the Earls’ and Bishops’ Palaces, which they hope will include a special mention on HES’ Canmore Database about the Glaitness Primary School’s annual productions held there. 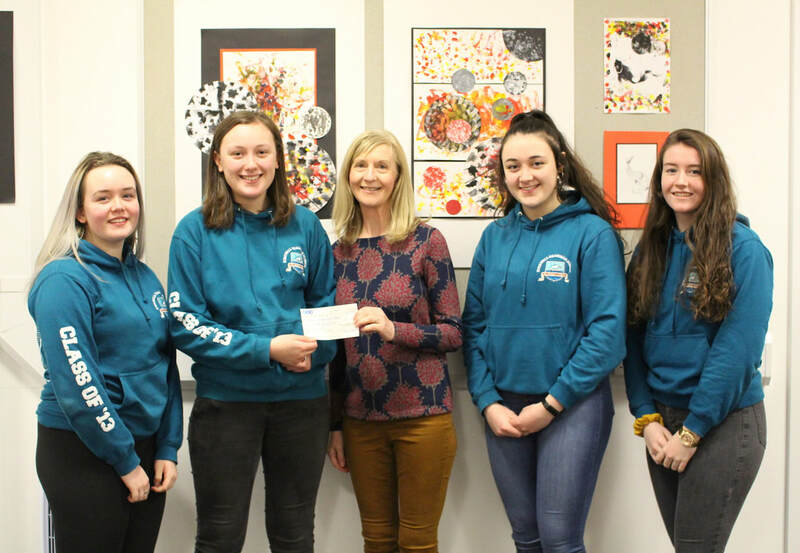 The pupils also agreed to protect the Peedie Sea, at which they sought to have extended information points placed to explain its history and heritage. Our students, particularly led by John Stevenson, argued compellingly for the preservation of the site of the former Wisebuys/Garden’s bakery premises. According to HES, this particular site could be provided with a mention on the Buildings At Risk Register. The students also agreed on the special significance of the Big Tree and have recommended to the HES that a permanent fixture should be put in place to note its history and importance to Kirkwall. Finally, the Tankerness House Gardens were noted as a site of particular significance to the pupils, especially the history of the Groatie House, which they deemed worthy of another permanent memorial. The staff from Historic Environment Scotland have taken the pupils' recommendations back to the senior managers in Edinburgh and hope to be able to come back to us in the new year with clarification of the manner in which these sites will be remembered, maintained and commemorated. Our pupils did a superb job of advocating for their history, heritage and significance to our town, and it looks likely that the work that these five have been involved in will last in the memory of Kirkwall for many years to come. The Higher RMPS class visited the Kirkwall Sheriff Court to meet and speak with the Procurator Fiscal, Sue Foard. In line with the requirements of their ‘Morality and Justice’ unit, the aim of the visit (which has become a productive yearly tradition) was to allow the class to see crime and punishment from a practical perspective. We are as always extremely grateful to Sue for her time and immeasurable help. The KGS U13 football team travelled to Dingwall last week to take on Dingwall Academy in the second round of the North of Scotland Schools Cup. Unfortunately, they started off poorly, conceding 3 early goals. (All of which could have been avoided, especially the first one as the boy who scored was about ten yards offside.) The boys managed to score one and had a couple of opportunities to make it 3-2. Unfortunately, Dingwall netted a couple before half-time and added two more in the second half. Final score: 7-1 to Dingwall. Anyway, the boys had a good time and were generally very well behaved throughout the two days. The staff at the hostel thought that they were polite and considerate. Our next matches will be in the new year, when we will organise a tournament in KGS. 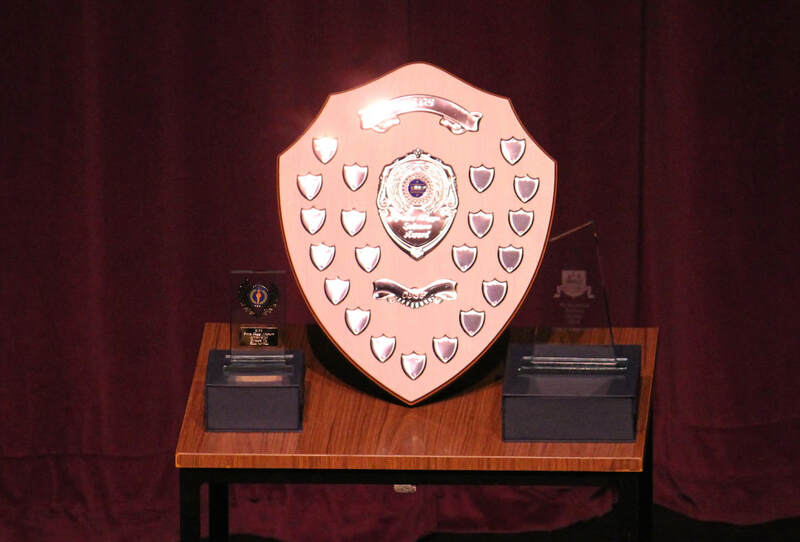 Schools from the North of Scotland (Tain, Thurso, Wick, and maybe Stromness, Golspie etc) will battle for The Eagle Cup, which we'll try to retain having won it two years ago! We are as always extremely grateful to our sponsors, Orkney Fisheries Association and The Indian Garden. The KGS U13 football team is travelling to Dingwall on Wednesday 21 November to face Dingwall Academy in the second round of the North of Scotland Schools Cup. We wish them all the best. They are pictured wearing their new training tops provided by Orkney Fisheries Association. Thanks to OFA for supporting our young footballers in their quest for sporting success. Yesterday Kirkwall Grammar School were delighted to be able to present the first ever Peter Higgs Science Award, sponsored by the Orkney International Science Festival. The award will be presented each year to our best Science student. The award is named after Professor Higgs (of Higgs Boson fame) and he had hoped to present the first one at the Science Festival this year, but unfortunately was not able to attend. In his absence, Dr Howie Firth, founder and Director of the Orkney International Science festival, was the perfect person to present the award. Dr Firth spoke of scientists who have received Nobel Prizes, about being taught by Peter Higgs at university himself, and highlighted the massive advancement in technology that would make present KGS pupils have a very different experience at university. There were some exceptional candidates for this award in Science at KGS this year. The Runner-up was Finn McGill and the Winner was Stella Kirkpatrick. The school is very pleased to let you know about recent changes in our Pupil Support team. Marlyn Firth, our new Guidance Manager, took up her post mid-September, and is now well on the way to becoming a very familiar face to our pupils. You will be seeing her at parents’ nights and other events, as well as around the school during the day. Marlyn is committed to ensuring that Guidance remains very much the hub of the school, with strong links between school, home and the community. We welcomed Amy Berry to KGS in August, in the part-time post of Family Support Worker. This is a completely new post in school; Amy will work with pupils, families and carers who may need a bit of support, particularly if a young person is finding it difficult to attend school, for whatever reason. She has already fitted into the Guidance team very well and we are really pleased to have her with us. 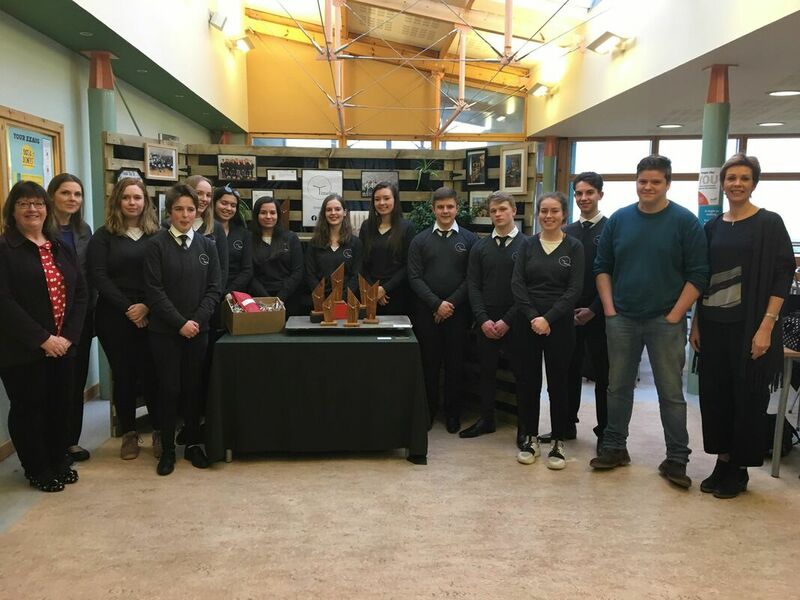 This year's Young Enterprise company, Timeless, recently launched their products, Standing Stone clocks inspired by their Orcadian heritage and made from recycled pallets, at the Voluntary Action Orkney Christmas fair, where they were well received. See the links on our home page for more information about how you can get hold of one. Last year's company, Estrela, were invited to the Scottish Parliament for the Business in Parliament 2018 event, along with Lite from Northfield Academy. They were presented to Parliament, met Nicola Sturgeon and took part in workshops. Congratulations to the KGS pupils who took part in the first ever Orkney Mini Trials that took place at Kirkwall Sheriff Court on Saturday 3 November. The standard of argument and questioning displayed by the teams from KGS, Stomness Academy and Westray Junior High was extremely high. The teams from KGS won both their trials, against strong competition, with a successful prosecution in the assault case in the morning and an acquital in the Drugs Trial in the afternoon. The KGS team were supported with their preparation by Procurator Fiscal Sue Foard and our thanks go to her. National 5 Hospitality: Practical Cookery pupils have been looking at the benefits of using of locally sourced fresh ingredients, along with healthy eating, as part of their course. Pupils made a traditional dish of spaghetti Bolognaise using locally sourced Scotch Beef PGI, as well as locally purchased fresh vegetables which included celery, carrots, onions and garlic. The Department registered with the QMS Meat Voucher Scheme and were successful in receiving a voucher towards the cost of buying the Scotch Beef PGI. S2 Geography pupils have been studying volcanoes and as homework were set the task of making their own. Some chose to make theirs from paper, but many opted to make cake volcanoes! Pictured are members of 2F1 proudly displaying their volcanoes. On Friday the Curriculum Support Department held a Big Coffee Morning and raised £375 for Macmillan Cancer Support. As well as selling coffee, tea and an array of delicious cakes and biscuits, staff and pupils held a raffle, tombola and competitions. The coffee morning was a big hit with staff, pupils and visitors alike. Congratulations and thanks go to all those involved in organising, serving, contributing and donating. This week Senior Modern Studies classes were visited by Iain Clark from the Scottish Parliament. He spoke to them about raising the age of Criminal Responsibility from 8 to 12 as part of Stage One of the Equalities and Human Rights Committee's work. Both N5 and Higher Modern Studies classes took part in discussions of evidence surrounding this issue and each pupil was able to vote on what they thought. These votes will be taken back to the Committee and will help inform the bill's progress in the Scottish Parliament.